After spending time in Spain and Germany as an agent in the Economic Warfare Unit in the summer of 1945 Peter Cotton is sent to Washington DC. John Maynard Keynes and a British team of negotiators are in the city trying to secure a loan to keep a bankrupt Britain afloat. A new world order and the cold war is emerging and the city is full of intrigue and spies who circulate through endless embassy parties. The Americans are reorganising their intelligence agencies and seem intent on destabilising British imperialism and growing their own spheres of influence. Cotton’s job is to circulate the parties and to try and pick-up useful information, and to build a relationship with an African-American scholar interested in the fate of Africa post-war and a former Soviet tank commander who seems to be his equivalent appointment in the Soviet embassy, reporting the results to his abrasive boss, Ayrtoun. Whilst he tries to find his feet he meets Katherine Ward, a beautiful analyst who works in the State Department and they start a tentative relationship. All the while, Keynes is struggling to get a workable financial deal. 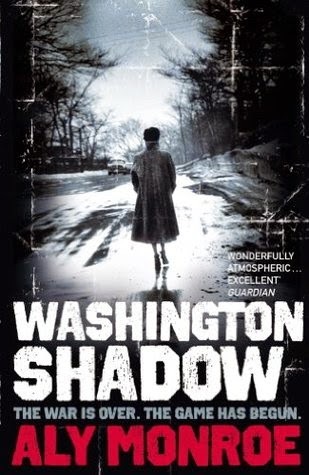 Washington Shadow is the second book in the Peter Cotton series following the exploits of an economics graduate who works as an intelligence officer (here are my reviews of books 1 and 3). Whilst the first book was set in Spain, the second sees Cotton move to Washington DC after his old unit is wound up and he waits to find out if he’s going to be demobbed. Despite winning the war, Britain is on its knees financially and is severely weakened politically with respect to its empire. The nice hook to the story is John Maynard Keynes presence in the city, trying to negotiate a loan from the Americans. The first half of the tale is atmospheric and evocative, and the historical contextualisation concerning the relationship between the US and Britain is interesting. Cotton is a little out of his depth and struggling to work out his role in what seems a fluid situation as the Americans re-organise their intelligence agencies and prepare for a new world order, and he hesitantly starts a relationship, his first serious one since the death of his fiancée to a blitz bomb. However, in the second half the storyline becomes a little disjointed, bitty and opaque, and rather than Cotton being at the centre of the action with respect to the Keynes negotiations, which might have provided a stronger hook, he’s hovering around the edges with an uncertain role. Perhaps Monroe is projecting the uncertainty and haphazardness of the British position onto Cotton, but it means the plot fizzles rather than sparkles. This was a shame as the first half was excellent. Nevertheless, it’s still an interesting read, with an engaging lead character and intriguing context.